The Keyhole: Peeking at 21st Century Brands: J.C. Penney Blame Game: Blaming Everybody Else Is Great Till There’s No One Left But You! J.C. Penney Blame Game: Blaming Everybody Else Is Great Till There’s No One Left But You! No, it’s not a new promotion, but it is the latest excuse for J.C. Penney’s holiday losses. OK, sure, the market hasn't’ been at its best, but shares of J.C Penney tumbled last week after the ever-struggling, emotional engagement-deficient retailer posted a loss for the holiday quarter, despite improving category sales trends. We can’t quite figure out why people were surprised about the results, which was the way it was spun in the press. But we weren’t. Surprised, we mean. J.C. Penney had been at the bottom of our Customer Loyalty Engagement Index for a while now. A long while and rankings on our Index correlate very highly with how consumers are going to behave toward a brand, so being at the bottom of the list meant that it wasn’t likely that consumers were going to swarm to the store in the coming months. And they didn’t, a kind of retail version of the old Yogi Berra observation, “if the shoppers don’t want to come to the store, you can’t stop’em!” Well, actually, you can stop them. 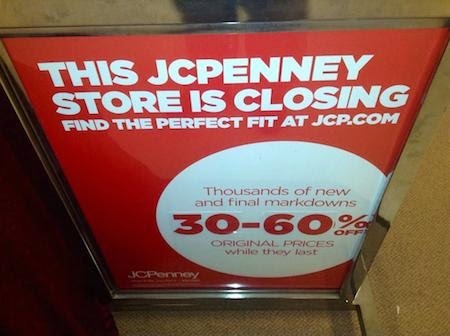 Just continue to market and brand just the way J.C. Penney has been doing for a while now! You can also blame someone else! That’s always easier than actually coming up with an authentic and emotionally engaging strategy for the brand. Despite the improving sales trends seen by other retailers, CEO Mike Ullman noted in a conference call last week that the company is “still trying to recover from the self-inflicted wounds of the previous strategy.” The wounds Mr. Ullman was referencing were those of ex-Apple VP Ron Johnson, who, to be sure, made a muck of things when he was JCP CEO, and was a real nuisance of himself. We blamed him for the JCP debacle back then too. But to be fair, that was more than two years ago, and in a marketplace that moves at the speed of the consumer, Mr. Ullman et. al. haven’t exactly made many inroads. Maybe a tiny in-path, but not much more than that. For the quarter, J.C. Penney said it lost $59 million, or 19 cents per share and shares slid almost 10% in aftermarket trading to $8.20. So the change of rank on the list is a precursor of some progress as regards consumer emotional engagement with the brand, a tiny glimmer of light at the end of the tunnel. And when your brand is wracked with nuisances like consumer disengagement, problematic product mix, confusing pricing strategies, and undistinguished and indistinguishable brand positionings and promotions, we’re thinking odds are 6 to 5 that light at the end of a tunnel really is an oncoming train. Smart marketers never bet against emotional engagement metrics.